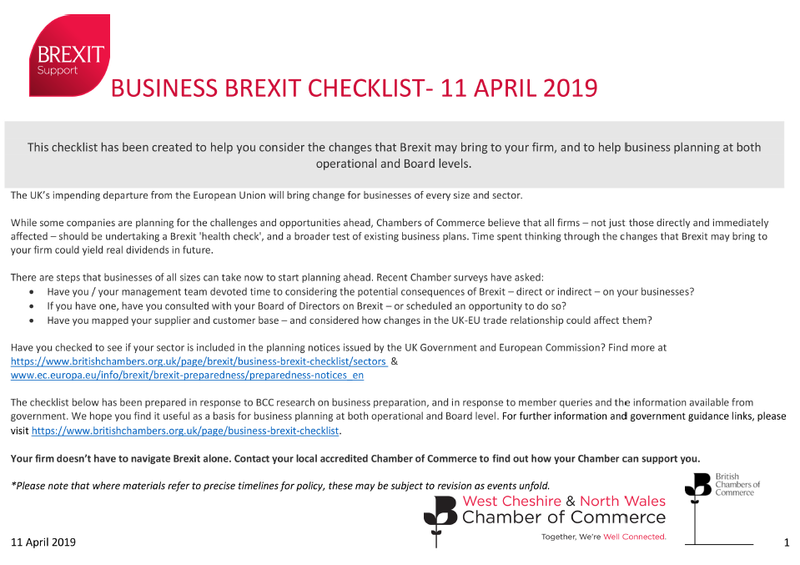 While some companies are already planning for the challenges and opportunities ahead, Chambers of Commerce believe that all firms – not just those directly and immediately affected – should be undertaking a Brexit ‘health check’, and a broader test of existing business plans. Time spent thinking through the changes that Brexit may bring to your firm could yield real dividends in the future. Have you/your management team devoted time to considering the potential consequences of Brexit – direct or indirect – on your business? This Business Brexit Checklist has been prepared in response to the findings, which suggest that a significant number of firms are either watching and waiting – or taking no action at all. We hope you find it useful as a basis for business planning at both operational and Board level. Your firm doesn’t have to navigate Brexit alone. Contact the West Cheshire & North Wales Chamber of Commerce to find out how we can support you.